Blizzard has announced the winners of its 2010 Holiday Dessert Contest and though I am truly a fan of festive baking, I don't think I could bring myself to eat a single one of these awesome creations. I learned a hard lesson over the 2009 holiday season: leave the baking to people who have some idea about what they're doing. Like the people who entered Blizzard's 2010 Holiday Dessert Contest, for instance. They sure seem to know their way around a kitchen. Rachael High from the U.K. submitted an amazing Murloc cake, while Jaclyn Nguyen of Texas created a sinister-looking goblin Santa out of molded Rice Krispie treats. 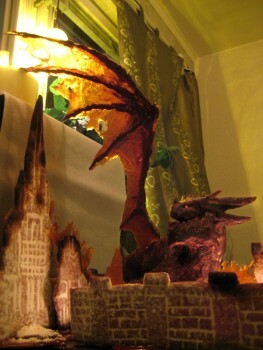 My favorite, I think, comes from Cecilia Arnqvist of Sweden, who put together a stunning gingerbread Stormwind City that's in the process of being destroyed by Deathwing, "a delicious and moist orange- and clove-flavored chocolate cake with wings of caramelized sugar." Even the honorable mentions are pretty amazing, although as a non-WoW player I don't recognize most of them. There's architecture, landscapes, armor and all kinds of creatures, and they all look way too cool to eat. Which isn't to say that I wouldn't eat them, I'd just wait for someone else to make the first move so I could avoid feeling guilty about destroying them as I crammed them down my gullet. Have a look at all the winners and pick your favorite at blizzard.com!